Shmup, in videogame parlance, is an abbreviation of shoot 'em up. Bullet hell is a shmup sub-genre in which the screen is filled with a ridiculous amount of enemy projectiles flying every-which-way. And finally, Cave, according to Wikipedia, is "one of the most active makers of arcade shoot-em-ups in the Japanese market." I tell you all of this because the website at Caveshmups.com indicates that at least some of its games are on their way to Steam. "Steam can't dodge these bullets," the site says in a brief message below the Cave and Steam logos. "Winter 2015." 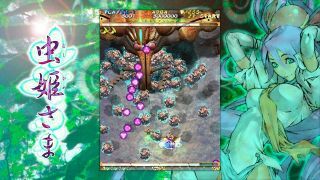 There's no mention of which games in particular are making the move, but PCGamesN notes that the purple stuff on the borders of the site is very reminiscent of Mushihimesama, which is apparently one of Cave's better-known games. The Cave Shmups site also offers a sign-up option for email notifications of future announcements. I don't play shoot-em-ups myself, but I did very much enjoy Shoot Em Up, a silly, fun movie starring Clive Owen and Paul Giamatti. It's not relevant to the videogame genre in any way whatsoever, but it's a solid choice if you're looking for something to watch this weekend.